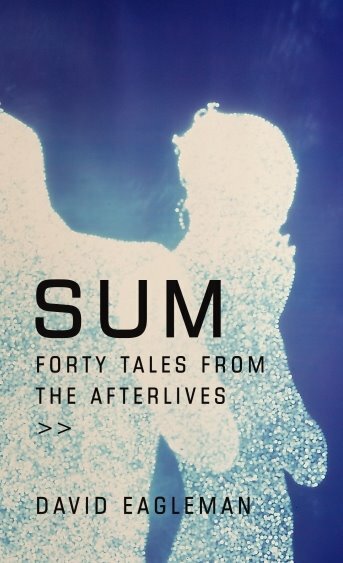 While in London last week, I was given a new book which came with a glowing recommendation: Sum by David Eagleman. I got through it in a few short train journeys, and it's an astonishing read. Written mostly in the second person ("You find yourself in a great padded compound...") like a choose-your-own adventure or role playing gamebook, it consists of forty short stories or thought experiments -- the genre is neither one nor the other, but both -- each embodying a different cosmic dénouement. That is, in the same way that storytellers sometimes propose a series of alternative endings for a narrative, this collection does that for life itself, by offering alternative afterlives. If this concept strikes you as self-important, dull, or contrived, as an experience, it was none of those things for me, and indeed such a misapprehension provides all the more reason to get hold of a copy. Also, if (like me) you are fascinated by Matters of Ultimate Concern but left cold by most traditional, religious and institutional responses to such mysteries, it is an outstanding read, by turns funny and moving, playful and profound, and important without being self-important. I'll leave it to you to find examples, if you want them, so I can focus here on the approach and tone of the book. It's highly original, and yet reminiscent of such diverse sources as the magical-realist thought experiments of Jorge Luis Borges, the now-light, now-dark cosmic wit of Neil Gaiman or Douglas Adams, and the philosophical vision, schematic-yet-personal, of Jim Carse's Finite and Infinite Games. In the stories there are shades of The Twilight Zone, The Truman Show, The Matrix, and more -- but I fear that merely to list such references does a disservice to the author, perhaps through too many comparisons conveying an impression of work that is excessively referential and diffuse, when in fact it has a beautiful, focused sense of its own agenda and voice. What Sum has in common with the above may be certain of its themes, and especially its willingness to engage in imaginative, big-picture speculation with a sensibility that encompasses or synthesises both the ironic and the romantic, both good humour and deep seriousness. In intent, perhaps most of all the book reminded me of the late, great psychonaut Terence McKenna, many of whose theories (Timewave Zero, psychedelic mushrooms as alien intelligences, etc) appear to have been designed not necessarily to convince his audience of their truth as such, but rather to prove how outlandish the various ideas are that it is not only possible, but also (given how little we truly know about the universe) plausible to believe. As John Lennon put it, "Reality leaves a lot to the imagination." And I learned today (via a blog entry at Amazon) that this is a theme which Eagleman -- a neuroscientist -- intends to take up in his next book, Why I Am A Possibilian. The notion of Possibilism (Possibilitarianism?) seems to me to provide an amusing and much-needed counter-meme to the narrow faux certainty of Singularitarianism, and I shall look forward to the follow up with great interest. Meanwhile, I urge regular readers of this blog -- in all likelihood, veteran Possibilians themselves -- to seek out Sum wherever you can find it. Like any well-wrought set of future scenarios, each story (hypothetical outcome) can be read as entirely consistent with what is known, or believed, about the past and present so far, while simply positing different next steps. And, like the artful exploration of alternative futures, the juxtaposition of these many alternative afterlives evokes a sense of possibility space in multiple dimensions which makes it far more than merely the sum of its parts. Thanks for this review! I picked up the book right after reading your post, and your recommendation was right on the money: this book is incredible! The author has a shockingly vast, humorous, and poignant imagination. I agree with you that it doesn't make sense to list too many other references, but I also detected shades here of the Cuban/Italian author Italo Calvino as well as the ones you mentioned. Nonetheless, Eagleman seems to have created something totally unique here. In any case, thanks again for the pointer -- I'm now telling all my friends about it! Mikki, thanks for your comment. I'm very pleased to hear you like Sum so much.